A warm welcome from Robert, Carys and team to The Liverpool Arms or The Livy as known locally. The Liverpool Arms is the last remaining nautical-themed pub/gastro pub in the buzzing, up and coming town of Menai Bridge. 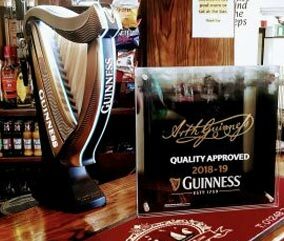 Located on the corner between Water St and St George’s Road down by the pier (opposite Dylan’s restaurant) we pride ourselves on quality and have been awarded three awards for our beers and ales – Cask mark, Good beer 2018 and Guinness perfect pour award. 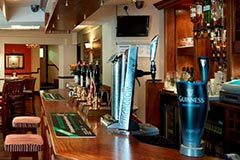 As well as the traditional drinks you will also find an extensive gin, whiskey and wine offering. 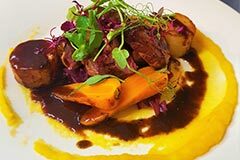 With four up and coming chefs creating wonderful meals in our 5-star food hygiene awarded kitchen we at The Liverpool Arms pride ourselves on providing an upmarket gastropub experience. This, coupled with the finest drinks available in Menai Bridge, ensure our customers a truly gastronomic experience. The whole ethos of the business is to use quality local ingredients. Using fresh local produce and supporting local producers is very important to us. Great food means using the best ingredients and we are fortunate enough to have most of these available to us on our doorstep here on Anglesey. 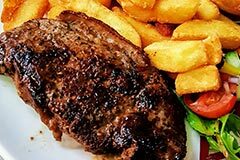 So, whatever your looking for from a casual meal, somewhere to celebrate a special occasion, drinks with friends or an outside eating and drinking are which welcomes dogs feel assured you’ll find it at The Liverpool Arms.